My kids are the same with the water bottles! It is so annoying. I hope your freezer gets fixed soon. Appliance problems are so frustrating! 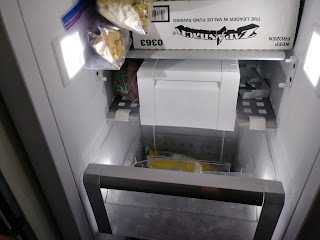 The freezer was a floor sample, but it is a Thermador. They have been very good about agreeing to get it fixed. If the stupid contractor had asked the plumber to check it months ago we wouldn't still be without ice. Ugggggg that sounds so frustrating! I hope that the new controller does the trick. I am posting an update soon. As usual, there is more to the story! That is irritating. But it's still under warranty, right? Oh, yes. It was a floor sample freezer, but it is a Thermador. The lady at the appliance store that I have worked with has been wonderful. If she knew what the repairman put me thru I think he would be out of a job. I am not going to share. He loused things up more . . . that post is coming soon.